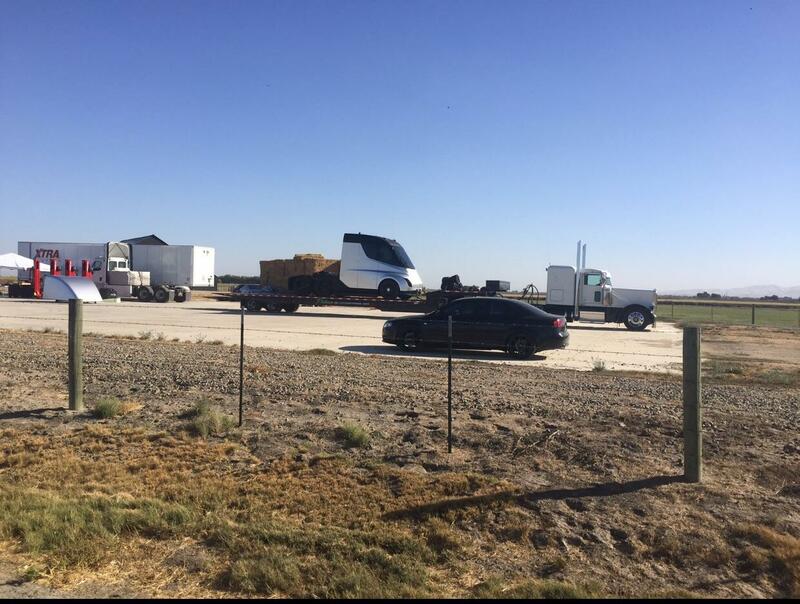 This may be our first real look at the highly anticipated Tesla Semi, though perhaps it’s a fake. The embedded image above is photoshopped, no doubt about it. But what you’re seeing is the aero top portion photoshopped onto what’s believed to be the actual Tesla semi (link to original image here). Set to be revealed later this month (October 26, to be precise), the Tesla Semi supposedly is designed for regional hauling, with a range of 200-300 miles. 16 Comments on "Possible First Image Of Tesla Semi Surfaces"
It looks photo-shopped, trailer no tractor, wires just floating in the air. Also around the wheels looks sort of fuzzy. There’s a tractor clearly visible in front of the trailer, and there are no floating wires. My hat is off to whoever Photoshopped that picture. It’s a professional job! So Tesla Semis driving between Tesla Fremont Factory and Tesla Sparks Gigafactory coming soon? I’m thinking a logical place to install Semi Superchargers would be at traditional truck stops. Would not be surprised to learn that Tesla is already in process installing those between Fremont & Sparks. That would totally ruin I-80 which is already jammed often. I hope they DONT install semi superchargers between fremont and sparks, that means it cant even make that distance! Better to install truck super chargers half way to LA and up to oregon and washington so new vehicles can get hauled outa the fremont factory. East coast bound cars can go by train. Well, it better be driver-less. That driver cabin is pretty darn close to the front like one of those Volvo trucks or buses which offers very little protection to the driver. Then again, that (lack of crumple zone) is probably not its primary concern. DragTimes will need to add a Tesla Semi to their Tesla fleet… Imagine DragTimes YouTube vids of Tesla Semi going up against traditional go-fast cars at drag strips! @Staff: How about adding the (hopefully non-Photoshopped) original photo, so we can contrast and compare? Is there a problem with the rights to the photo? Now it does look real. It’s just parked. The cropped one seemed suspect to me. Oops! Mea culpa. What I called a “clearly visible” semi tractor hauling the trailer is shown in the original photo linked in the article, but it’s cropped out of the picture that is posted at the top. No problem, it clearly shows the tractor and trailer are separate anyway. The semi is just sitting on a parked trailer. Door handles? We don’t need no stinkin’ door handles! It doesn’t have road legal windshield. Black windshields are not allowed. But who cares, black windshield and empty promises about “full autonomy any times soon” will make it look cooler for its main purpose – dog & pony show to sell more shares to gullible congregation.